The office is not established by any statute or constitutional document but exists only by long-established convention, which stipulates that the monarch must appoint as Prime Minister the person most likely to command the confidence of the House of Commons;  this individual is typically the leader of the political party or coalition of parties that holds the largest number of seats in that chamber. The position of Prime Minister was not created; it evolved slowly and erratically over three hundred years due to numerous acts of Parliament, political developments, and accidents of history. The office is therefore best understood from a historical perspective. The origins of the position are found in constitutional changes that occurred during the Revolutionary Settlement (1688–1720) and the resulting shift of political power from the Sovereign to Parliament. Although the Sovereign was not stripped of the ancient prerogative powers and legally remained the head of government, politically it gradually became necessary for him or her to govern through a Prime Minister who could command a majority in Parliament. In the United Kingdom, confidence motions are a means of testing the support of the government (executive) in a legislative body, and for the legislature to remove the government from office. A confidence motion may take the form of either a vote of confidence, usually put forward by the government, or a vote of no confidence, usually proposed by the opposition. When such a motion is put to a vote in the legislature, if a vote of confidence is defeated, or a vote of no confidence is passed, then the incumbent government must resign, or call a general election.. The Westminster system is a parliamentary system of government developed in the United Kingdom. This term comes from the Palace of Westminster, the seat of the British Parliament. The system is a series of procedures for operating a legislature. 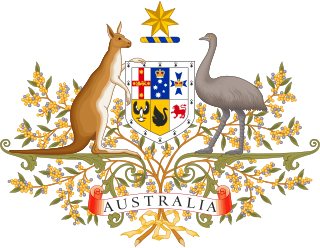 It is used, or was once used, in the national legislatures and subnational legislatures of most former British Empire colonies upon gaining responsible government, beginning with the first of the Canadian provinces in 1848 and the six Australian colonies between 1855 and 1890. However, some former colonies have since adopted either the presidential system or a hybrid system as their form of government. 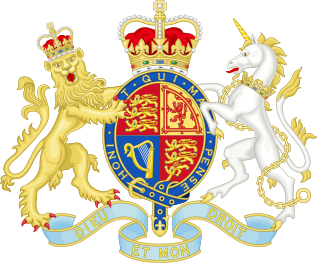 The Parliament Act 1911 is an Act of the Parliament of the United Kingdom. It is constitutionally important and partly governs the relationship between the House of Commons and the House of Lords, which make up the two Houses of Parliament. This Act and the Parliament Act 1949 are technically to be construed as complementary in their effects. The two Acts may be cited together as the Parliament Acts 1911 and 1949. 10 Downing Street, also known colloquially in the United Kingdom simply as Number 10, is the headquarters of the Government of the United Kingdom and the official residence and office of the First Lord of the Treasury, a post which, for much of the 18th and 19th centuries and invariably since 1905, has been held by the Prime Minister of the United Kingdom. The relationships between the Prime Minister and the Sovereign, Parliament and Cabinet are defined largely by these unwritten conventions of the constitution. Many of the Prime Minister's executive and legislative powers are actually royal prerogatives which are still formally vested in the Sovereign, who remains the head of state. Despite its growing dominance in the constitutional hierarchy, the premiership was given little formal recognition until the 20th century; the legal fiction was maintained that the Sovereign still governed directly. The position was first mentioned in statute only in 1917, in the schedule of the Chequers Estate Act. Increasingly during the 20th century, the office and role of Prime Minister featured in statute law and official documents; however, the Prime Minister's powers and relationships with other institutions still largely continue to derive from ancient royal prerogatives and historic and modern constitutional conventions. Prime ministers continue to hold the position of First Lord of the Treasury and, since November 1968, that of Minister for the Civil Service, the latter giving them authority over the civil service. Under this arrangement, Britain might appear to have two executives: the Prime Minister and the Sovereign. The concept of "the Crown" resolves this paradox. The Crown symbolises the state's authority to govern: to make laws and execute them, impose taxes and collect them, declare war and make peace. Before the "Glorious Revolution" of 1688, the Sovereign exclusively wielded the powers of the Crown; afterwards, Parliament gradually forced monarchs to assume a neutral political position. Parliament has effectively dispersed the powers of the Crown, entrusting its authority to responsible ministers (the Prime Minister and Cabinet), accountable for their policies and actions to Parliament, in particular the elected House of Commons. Because the Premiership was not intentionally created, there is no exact date when its evolution began. A meaningful starting point, however, is 1688–89 when James II fled England and the Parliament of England confirmed William and Mary as joint constitutional monarchs, enacting legislation that limited their authority and that of their successors: the Bill of Rights (1689), the Mutiny Bill (1689), the Triennial Bill (1694), the Treason Act (1696) and the Act of Settlement (1701). Known collectively as the Revolutionary Settlement, these acts transformed the constitution, shifting the balance of power from the Sovereign to Parliament. They also provided the basis for the evolution of the office of Prime Minister, which did not exist at that time. The term "Prime Minister" appears at this time as an unofficial title for the leader of the government, usually the Head of the Treasury. Jonathan Swift, for example, wrote in 1713 about "those who are now commonly called Prime Minister among us", referring to Sidney Godolphin, 1st Earl of Godolphin and Robert Harley, Queen Anne's Lord Treasurers and chief ministers. Since 1721, every head of the Sovereign's government – with one exception in the 18th century (William Pitt the Elder) and one in the 19th (Lord Salisbury) – has been First Lord of the Treasury. The term "Cabinet" first appears after the Revolutionary Settlement to describe those ministers who conferred privately with the Sovereign. 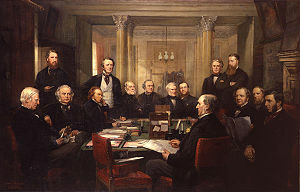 The growth of the Cabinet met with widespread complaint and opposition because its meetings were often held in secret and it excluded the ancient Privy Council (of which the Cabinet is formally a committee) from the Sovereign's circle of advisers, reducing it to an honorary body. The early Cabinet, like that of today, included the Treasurer and other department heads who sat on the Treasury bench. However, it might also include individuals who were not members of Parliament such as household officers (e.g. the Master of the Horse) and members of the royal family. The exclusion of non-members of Parliament from the Cabinet was essential to the development of ministerial accountability and responsibility. When the general election of 2010 produced a hung parliament, the Conservative and Liberal Democrat parties agreed to form the Cameron–Clegg coalition, the first coalition in seventy years. The previous coalition in the UK before 2010 was led by Conservative Prime Minister Winston Churchill during most of the Second World War, from May 1940 to May 1945. Clement Attlee, the leader of the Labour Party, served as deputy Prime Minister. After the general election of 2015, the nation returned to one party government after the Tories won an outright majority. For all his contributions, Walpole was not a prime minister in the modern sense. The king – not Parliament – chose him; and the king – not Walpole – chose the Cabinet. Walpole set an example, not a precedent, and few followed his example. For over 40 years after Walpole's fall in 1742, there was widespread ambivalence about the position. In some cases, the prime minister was a figurehead with power being wielded by other individuals; in others there was a reversion to the "chief minister" model of earlier times in which the sovereign actually governed. At other times, there appeared to be two prime ministers. During Britain's participation in the Seven Years' War, for example, the powers of government were divided equally between the Duke of Newcastle and William Pitt, 1st Earl of Chatham, leading to them both alternatively being described as prime minister. Furthermore, many thought that the title "Prime Minister" usurped the sovereign's constitutional position as "head of the government" and that it was an affront to other ministers because they were all appointed by and equally responsible to the sovereign. The first Act of Parliament to mention the premiership – albeit in a schedule – was the Chequers Estate Act on 20 December 1917. 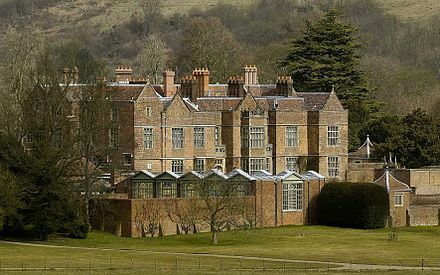 This law conferred the Chequers Estate owned by Sir Arthur and Lady Lee, as a gift to the Crown for use as a country home for future prime ministers. Despite the reluctance to legally recognise the Premiership, ambivalence toward it waned in the 1780s. During the first 20 years of his reign, George III (1760–1820) tried to be his own "prime minister" by controlling policy from outside the Cabinet, appointing and dismissing ministers, meeting privately with individual ministers, and giving them instructions. These practices caused confusion and dissension in Cabinet meetings; King George's experiment in personal rule was generally a failure. After the failure of Lord North's ministry (1770–1782) in March 1782 due to Britain's defeat in the American Revolutionary War and the ensuing vote of no confidence by Parliament, the Marquess of Rockingham reasserted the Prime Minister's control over the Cabinet. Rockingham assumed the Premiership "on the distinct understanding that measures were to be changed as well as men; and that the measures for which the new ministry required the royal consent were the measures which they, while in opposition, had advocated." He and his Cabinet were united in their policies and would stand or fall together; they also refused to accept anyone in the Cabinet who did not agree. [note 5] King George threatened to abdicate but in the end reluctantly agreed out of necessity: he had to have a government. ^ Shannon, Richard (1984). Gladstone: 1809-1865 (p.342). p. 580. ISBN 0807815918 . Retrieved 30 January 2010. The modern British system includes not only a government formed by the majority party (or coalition of parties) in the House of Commons but also an organised and open opposition formed by those who are not members of the governing party. Called Her Majesty's Most Loyal Opposition, they occupy the benches to the Speaker's left. 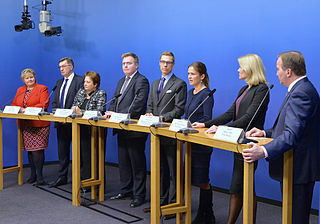 Seated in the front, directly across from the ministers on the Treasury Bench, the leaders of the opposition form a "Shadow Government", complete with a salaried "Shadow Prime Minister", the Leader of the Opposition, ready to assume office if the government falls or loses the next election. Opposing the King's government was considered disloyal, even treasonous, at the end of the 17th century. During the 18th century this idea waned and finally disappeared as the two party system developed. The expression "His Majesty's Opposition" was coined by John Hobhouse, 1st Baron Broughton. In 1826, Broughton, a Whig, announced in the Commons that he opposed the report of a Bill. As a joke, he said, "It was said to be very hard on His Majesty's ministers to raise objections to this proposition. For my part, I think it is much more hard on His Majesty's Opposition to compel them to take this course." The phrase caught on and has been used ever since. Sometimes rendered as the "Loyal Opposition", it acknowledges the legitimate existence of the two party system, and describes an important constitutional concept: opposing the government is not treason; reasonable men can honestly oppose its policies and still be loyal to the Sovereign and the nation. British prime ministers have never been elected directly by the public. A prime minister need not be a party leader; David Lloyd George was not a party leader during his service as prime Minister during World War I, and neither was Ramsay MacDonald from 1931 to 1935. Prime Ministers have taken office because they were members of either the Commons or Lords, and either inherited a majority in the Commons or won more seats than the opposition in a general election. Since 1722, most prime ministers have been members of the Commons; since 1902, all have had a seat there. [note 6] Like other members, they are elected initially to represent only a constituency. Former Prime Minister Tony Blair, for example, represented Sedgefield in County Durham from 1983 to 2007. He became Prime Minister because in 1994 he was elected Labour Party leader and then led the party to victory in the 1997 general election, winning 418 seats compared to 165 for the Conservatives and gaining a majority in the House of Commons. Benjamin Disraeli and William Ewart Gladstone developed this new role further by projecting "images" of themselves to the public. 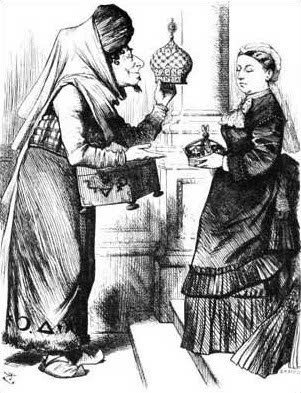 Known by their nicknames "Dizzy" and the "Grand Old Man", their colourful, sometimes bitter, personal and political rivalry over the issues of their time – Imperialism vs. Anti-Imperialism, expansion of the franchise, labour reform, and Irish Home Rule – spanned almost twenty years until Disraeli's death in 1881. [note 9] Documented by the penny press, photographs and political cartoons, their rivalry linked specific personalities with the Premiership in the public mind and further enhanced its status. The Parliament Act 1911 established the supremacy of the Commons. It provided that the Lords could not delay for more than one month any bill certified by the Speaker of the Commons as a money bill. Furthermore, the Act provided that any bill rejected by the Lords would nevertheless become law if passed by the Commons in three successive sessions provided that two years had elapsed since its original passage. The Lords could still delay or suspend the enactment of legislation but could no longer veto it. Subsequently the Lords "suspending" power was reduced to one year by the Parliament Act 1949. When commissioned by the Sovereign, a potential Prime Minister's first requisite is to "form a Government" – to create a cabinet of ministers that has the support of the House of Commons, of which they are expected to be a member. The Prime Minister then formally kisses the hands of the Sovereign, whose royal prerogative powers are thereafter exercised solely on the advice of the Prime Minister and Her Majesty's Government ("HMG"). The Prime Minister has weekly audiences with the Sovereign, whose rights are constitutionally limited: "to warn, to encourage, and to be consulted";  the extent of the Sovereign's ability to influence the nature of the Prime Ministerial advice is unknown, but presumably varies depending upon the personal relationship between the Sovereign and the Prime Minister of the day. The Prime Minister makes all the most senior Crown appointments, and most others are made by Ministers over whom the PM has the power of appointment and dismissal. Privy Counsellors, Ambassadors and High Commissioners, senior civil servants, senior military officers, members of important committees and commissions, and other officials are selected, and in most cases may be removed, by the Prime Minister. The PM also formally advises the Sovereign on the appointment of Archbishops and Bishops of the Church of England,  but the PM's discretion is limited by the existence of the Crown Nominations Commission. The appointment of senior judges, while constitutionally still on the advice of the Prime Minister, is now made on the basis of recommendations from independent bodies. In 2010 the Prime Minister received £142,500 including a salary of £65,737 as a member of parliament. Until 2006, the Lord Chancellor was the highest paid member of the government, ahead of the Prime Minister. This reflected the Lord Chancellor's position at the head of the judicial pay scale. The Constitutional Reform Act 2005 eliminated the Lord Chancellor's judicial functions and also reduced the office's salary to below that of the Prime Minister. According to the now defunct Department for Constitutional Affairs, the Prime Minister is made a Privy Counsellor as a result of taking office and should be addressed by the official title prefixed by "The Right Honourable" and not by a personal name. [ citation needed ] Although this form of address is employed on formal occasions, it is rarely used by the media. As "Prime Minister" is a position, not a title, the incumbent should be referred to as "the Prime Minister". The title "Prime Minister" (e.g. "Prime Minister James Smith") is technically incorrect but is sometimes used erroneously outside the United Kingdom, and has more recently become acceptable within it. Within the UK, the expression "Prime Minister Smith" is never used, although it, too, is sometimes used by foreign dignitaries and news sources. Historically it has also been common to grant prime ministers a peerage upon retirement from the Commons, elevating the individual to the Lords. Formerly, the peerage bestowed was usually an earldom. [note 14] The last such creation was for Harold Macmillan, who resigned in 1963. Unusually, he became Earl of Stockton only in 1984, over twenty years after leaving office. ↑ Once in office, the Prime Minister fills not only Cabinet level positions but many other government offices (up to 90 appointments), selected mostly from the House of Commons, distributing them to party members, partly as a reward for their loyalty. The power to make so many appointments to government offices is one of the most effective means the Prime Minister has of maintaining party discipline in the Commons. ↑ Following a series of reforms in the twentieth century the Lords now consists almost entirely of appointed members who hold their title only for their own lifetime. 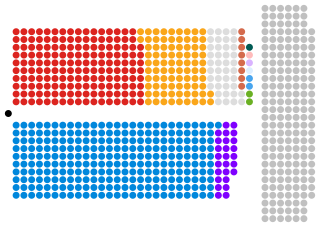 As of 11 June 2012 the Lords had 763 members (excluding 49 who were on leave of absence or otherwise disqualified from sitting), compared to 646 in the Commons. ↑ This circumstance is somewhat confused, however, as since the Great Reform Act 1832, only seven Scots have served as Prime Minister. Of these, two – Bonar Law and Ramsay MacDonald – died while still sitting in the Commons, not yet having retired; another, the Earl of Aberdeen, was appointed to both the Order of the Garter and the Order of the Thistle; yet another, Arthur Balfour, was appointed to the Order of the Garter, but represented an English constituency and may not have considered himself entirely Scottish; and of the remaining three, the Earl of Rosebery became a KG, Alec Douglas-Home became a KT, and Gordon Brown remained in the House of Commons as a backbencher until 2015. ↑ As First Lord of the Treasury and de facto first Prime Minister. While the United Kingdom does not have a codified constitution that is a single document, the collection of legal instruments that have developed into a body of law known as constitutional law has existed for hundreds of years. The Cabinet Manual is a government document in the United Kingdom which sets out the main laws, rules and conventions affecting the conduct and operation of the Government of the United Kingdom. It was written by Her Majesty's Civil Service, led by Cabinet Secretary Sir Gus O'Donnell, and was published by the Cabinet Office on 14 December 2010. The Manual gives an overview of the UK's system of government, reflecting the importance of Parliament, Cabinet government and the democratic nature of the UK’s constitutional arrangements by explaining the powers of the Executive, Sovereign, Parliament, international institutions, the Crown Dependencies, British Overseas Territories and the devolved administrations in Northern Ireland, Scotland and Wales. The Manual was written as a guide for members of Cabinet, other ministers and civil servants in the execution of government business, but also serves to consolidate many of the previously unwritten constructional conventions through which the British government operates. ↑ "Public List" (PDF). United Nations Protocol and Liaison Office. 24 August 2016. p. 61. Retrieved 28 December 2018. ↑ "Salaries of Members of Her Majesty's Government from 9th June 2017" (PDF). Retrieved 2018-12-28. ↑ "What is the annual salary of an MP?". Parliament.uk. 2010-04-21. Retrieved 2018-12-28. ↑ "Prime Minister - GOV.UK". ↑ "The principles of government formation (Section 2.8)". The Cabinet Manual (1st ed.). Cabinet Office. October 2011. p. 14. Retrieved 24 July 2016. Prime Ministers hold office unless and until they resign. If the Prime Minister resigns on behalf of the Government, the Sovereign will invite the person who appears most likely to be able to command the confidence of the House to serve as Prime Minister and to form a government. ↑ "George I" . Retrieved 4 April 2014. ↑ "Prime Minister". GOV.UK. Archived from the original on 14 October 2017. Retrieved 19 May 2018. ↑ "Standing Orders of the House of Commons" (PDF). London, United Kingdom: Parliament of the United Kingdom. 16 December 2009. p. 65. ↑ Taylor, Stephen (2002). "Robert Walpole". In Eccleshall, Robert; Walker, Graham. Biographical Dictionary of British Prime Ministers. Routledge. p. 10. ↑ Bogdanor, Vernon (2 February 2007). "A dictatoror (sic) first among equals?". Times Higher Education. Retrieved 3 May 2012. ↑ "The institution of Prime Minister is entrenched". GOV.UK. ↑ "THE CABINET". Hansard. 3 July 1885. ↑ Rozenberg, Joshua (3 June 1998). "UK Politics: Talking Politics – Conventions of the constitution". BBC News. Retrieved 2 November 2008. ↑ See letter, dated, "Downing Street, 30 June 1742", from Horace Walpole to Sir Horace Mann: "I am writing to you in one of the charming rooms towards the Park: it is I am willing to enjoy this sweet corner while I may, for we are soon to quit it. Mrs. Sandys came yesterday to give us warning; Lord Wilmington has lent it to them. Sir Robert might have had it for his own at first: but would only take it as First Lord of the Treasury. He goes into a small house of his own in Arlington Street, opposite to where we formerly lived". (Horace Walpole's Letters, ed. Cunningham, 1857, I, p. 246.) British History Online, From: 'No. 10, Downing Street', Survey of London: volume 14: St Margaret, Westminster, part III: Whitehall II (1931), pp. 113–141. Date accessed: 21 July 2008. ↑ Blake, Robert (1993). "How Churchill Became Prime Minister". In Blake, Robert B.; Louis, William Roger. Churchill. Oxford: Clarendon Press. pp. 262–263. ISBN 978-0-19-820626-2. ↑ Minney, p. 216. Contemporaries seemed to sense from the beginning that history was being made. Lord Creevey, for example, recorded in his diary, "I dined in Downing Street with Lady Grey... After dinner the private secretary to the Prime Minister and myself being alone, I ascertained that although Lord Grey was gone to Brighton ostensibly to prick for Sheriffs for the year, his great object was to put his plan of reform before the King, previous... to its being proposed to the House of Commons. A ticklish operation, this! to propose to a Sovereign a plan for reducing his own power and patronage. However, there is the plan all cut and dry, and the Cabinet unanimous upon it... Grey is determined to fight it out to a dissolution of Parliament, if his plan is beat in the Commons. My eye, what a crisis!" ↑ "House of Lords: Breakdown of Lords by party strength and type of peerage". 1 May 2008. Archived from the original on 14 May 2008. Retrieved 25 May 2008. ↑ "House of Commons: State of the parties". 23 May 2008. Archived from the original on 11 May 2008. Retrieved 25 May 2008. ↑ Jones, Bill; Norton, Philip; Daddow, Oliver (2018). Politics UK. Abingdon: Routledge. p. 454. ↑ Poguntke, Thomas; Webb, Paul (2005). The Presidentialization of Politics: A Comparative Study of Modern Democracies. Oxford: Oxford University Press. p. 5. ↑ Fairclough, Paul (2002). "6.1 The Primemister". Advanced Government and Politics. Oxford University Press. ISBN 978-0-19-913434-2. 1 2 Mackintosh, John. P (1962). The British Cabinet. London: Stevens. pp. 2–25. 1 2 3 Crossman, Richard; Bagehot, Walter (1963). "Introduction". The English Constitution. London: Fontana. pp. 1–57. 1 2 Foley, Michael (1993). The Rise of the British Presidency. Manchester: Manchester University Press. p. 283. ↑ Foley, Michael (2000). The British Presidency: Tony Blair and the Politics of Public Leadership. Manchester: Manchester University Press. ↑ Foster, Christopher (2005). 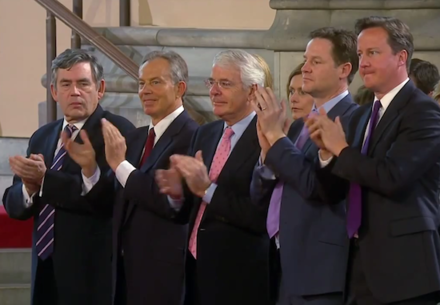 "Chapter 12 Blair's Cabinet: Monarchy Returns". British Government in Crisis. Hart Publishing. ↑ "Short launches broadside on Blair". BBC News. 12 May 2003. Retrieved 23 April 2006. ↑ Allen, Graham (14 February 2017). The Last Prime Minister: Being Honest About the UK Presidency. Andrews UK Limited. ISBN 978-1-84540-609-7. 1 2 3 Dowding, Keith (April 2017). "The Prime Ministerialisation of the British Prime Minister". Parliamentary Affairs. 66: 617–635. ↑ Hart, John (1991). "President and Prime Minister: Convergence or Divergence". Parliamentary Affairs. 44: 208–225. ↑ Williams, Andy (1998). "Prime ministerial government". UK Government & Politics. Heinemann. pp. 113–114. ISBN 978-0-435-33158-0. ↑ Palekar, S.A. (2008). "Position of the Prime Minister". Comparative Politics and Government. PHI Learning Pvt. Ltd. p. 37. ISBN 978-81-203-3335-2. ↑ Bagehot, Walter (1867). The English Constitution. Project Gutenburg Ebook. Retrieved 25 April 2012. ↑ Booth, Jenny (7 February 2006). "Blair defends school reform climbdown". The Times. London. ↑ Cameron, David (11 May 2010). "David Cameron becomes PM: Full Downing Street statement". BBC News. Retrieved 11 May 2010. ↑ May, Theresa (13 July 2016). "Prime Minister Theresa May promises 'a better Britain' - the full speech". Total Politics . Retrieved 13 July 2016. ↑ An example of "Prime Minister" being used as a title, even by Number 10 Downing Street. "PM attends European Council". 16 September 2010. Retrieved 17 September 2010. ↑ Rasor, Eugene L. (2000). Winston S. Churchill, 1874–1965: a comprehensive historiography and annotated bibliography. Greenwood Publishing Group. p. 205. ISBN 978-0-313-30546-7. 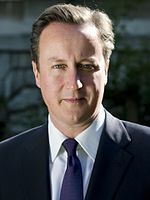 Wikimedia Commons has media related to Prime ministers of the United Kingdom .